The defending champion lost the fourth and fifth sets 1-6, 1-6 to exit at the quarter-final stage. The world number one was stunned on Centre Court. 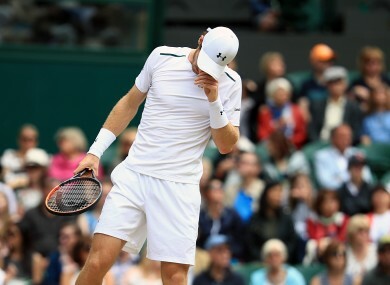 SAM QUERREY SENT hobbling defending champion Andy Murray crashing out of Wimbledon this afternoon, reaching his first Grand Slam semi-final at the 42nd attempt. One year after knocking out 2015 champion Novak Djokovic in the third round, 29-year-old Querrey, the world number 28, won 3-6, 6-4, 6-7 (4/7), 6-1, 6-1. World number one Murray’s challenge petered out when he began limping off his right leg, his movement severely compromised by a recent hip problem. Querrey will face either Gilles Muller of Luxembourg, who stunned Rafael Nadal in the fourth round, or former US Open champion Marin Cilic for a place in the final. “I’m still in a state of shock. I’m glad I hit that last serve in,” said Querrey who finished with 27 aces and 70 winners. Querrey is the first American man in the semi-finals of a Grand Slam since Andy Roddick finished runner-up at Wimbledon in 2009. “It feels great. It’s a dream come true to be in the semi-final at Wimbledon, it’s very special,” Querrey added. There was no sign of the drama to come at the start of Wednesday’s match. Murray, 30, was supreme in the first set, carving out the key break for 2-0 and taking the opener on the back of just two unforced errors. The Scot was a break to the good at 4-3 in the second before Querrey unexpectedly reeled off three straight games to level the quarter-final, firing 16 winners, twice as many as the top seed. Murray restored his lead after Querrey played a sloppy tiebreak in the third set. However, the champion’s afternoon on Centre Court began to unravel as his movement became increasingly limited. Limping badly off his right leg, Murray was being run ragged and was broken three times in a 22-minute fourth set. The other semi-final will see either seven-time champion Roger Federer or 2016 runner-up Milos Raonic tackle either Djokovic or 2010 runner-up Tomas Berdych. Djokovic can reclaim the world number one spot from Murray if he goes on to win a fourth Wimbledon title on Sunday. Federer, playing his 100th match at the All England Club, attempts to reach a record 12th Wimbledon semi-final and stay on course for a record eighth title when he faces Raonic. However, the 35-year-old Swiss star is wary of the sixth-seeded Canadian, who knocked him out in the semi-finals in 2016 in what proved to be Federer’s last match of the season. Federer leads Raonic 9-3 in head-to-head meetings and has reached his 50th Grand Slam quarter-final without dropping a set. “I’ve not had the most toughest matches. I can look at this quarter-final in a totally relaxed fashion. Physically I’m not fighting anything like last year with my knee,” added Federer, bidding to become the tournament’s oldest champion in the Open era. Raonic, runner-up to Murray last year, is bidding to make the semi-finals for the third time. However, while Federer has not dropped a set, the big Canadian needed five sets to see off highly-rated German Alexander Zverev in the last-16. Djokovic takes a staggering 25-2 career record over Czech 11th seed Berdych into his quarter-final as he eyes a potential semi-final duel with Federer. Second seeded Djokovic needed a medical timeout to treat a long-standing right shoulder injury in his last-16 clash with Adrian Mannarino. He also claimed a hole had opened up on the service line on the Centre Court. “The courts are not great this year — I’ve played on better courts,” said Djokovic. Berdych hasn’t defeated Djokovic since 2013 but he did triumph over the Serb at Wimbledon in the semi-finals seven years ago when the Czech finished runner-up to Nadal. Email “Hobbling Murray sent crashing out of Wimbledon by Querrey ”. Feedback on “Hobbling Murray sent crashing out of Wimbledon by Querrey ”.